I was very excited to find Avery and Owen as the lead characters in The Last Boyfriend. Even in Happily Ever After I was drawn to Owen and his matter of fact way of getting business done. I kind of figure that he would be drawn to Avery. Their personalities and quirks seems to be a decent match. What I enjoyed even more was the growth and opening of the Inn. I have always wanted to run a Bed and Breakfast so this behind the scenes peek at what it might take was probably a bigger draw for me than most readers but I find it all fascinating. The ideas that grow in the characters of this story are amazing and as always there are a few surprises along the way that I never saw coming and since they are not mentioned in the blurb for the story, I am not going to share them either. That being said, the background that we get in this story is amazing and explains so much. Owen was Avery's first boyfriend way back when they were just little kids, little did they know that down the road they would find themselves together again. Owen, for sure, has his work cut out for him when he realizes that he has fallen for Avery because she has other things on her mind and since Owen's family holds the key to all her dreams, she can't bring herself to just fall for him. 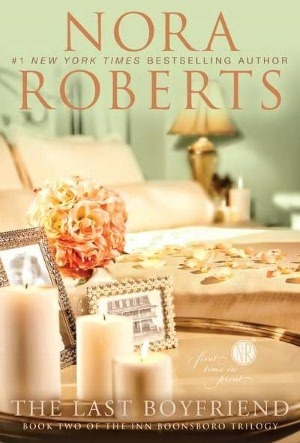 Nora Roberts does an outstanding job with balancing the love story and the plot that ties the three books together. In The Last Boyfriend, we get to see what is going on with Clare and Beckett and the boys from The Next Always as they come up on their wedding date, building a home for them all to live in and the opening of the Inn. It is always nice to catch up with old friends and find out what is going on. That is one of my favorite things about Nora Roberts trilogies. Not only is she an outstanding story teller but she is great at keeping us in the loop. My absolute favorite scene in The Last Boyfriend is that of the night before the Inn opens to the public when everyone stays at the Inn. The joy and sense of accomplishment is grand and there are some surprises along the way, including a visit from the friendly Inn ghost. While this is a smaller story line that in some of the previous Nora Roberts book, I enjoy it. Sign into Goodreads to see if any of your friends have read The Last Boyfriend.